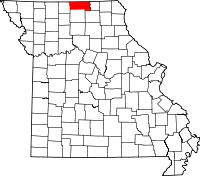 Several offices and departments, all located within the Putnam County Courthouse on 1601 West Main in Unionville, MO, have records for the area all ranging through a large span of years. The Clerk of the Probate Clerk has probate records from 1857 to 1889, will records from 1857 to 1929, index to probate records from 1853 to 1977, and others. Clerk of the County Court has birth records from 1878 to 1907. The Recorder of Deeds has deed records from 1847 to 1890 and an index to deeds from 1871 to 1889, as well as marriage records from 1881 to the present. And the Clerk of the Circuit Court has circuit court records from 1855 to 1888, divorce records from 1855 to 1892, and others. Also, the Putnam County Health Department at 1613 Grant Street, also in Unionville, has birth and death records beginning in 1910 and continuing to the present. Note: Give them book and page, they can make a doc copy $1.00 per page, prepaid.